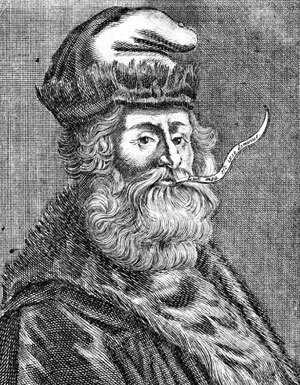 The Catalan Ramon Llull (1232–1315), called in Latin Raimundus (Raymundus) Lullus or Lullius, was born and died on the island of Mallorca. He was a member of the court of James II of Majorca, a childhood friend. Llull was one of the most prominent European writers, philosophers and scientists of 13th and 14th centuries. Llull was an extremely talented and productive person, known to have written at least 265 works in Catalan, Arabic and Latin. (About 400 works are attributed to him, but scholars have their doubts.) His writings include: the first major work of Catalan literature and perhaps the first European novel—the romantic novel Blanquerna; the manuscripts Ars notandi, Ars eleccionis and Alia ars eleccionis, in which he anticipated by several centuries prominent work on elections theory; number of treatises on alchemy, botany, astronomy, and so forth. 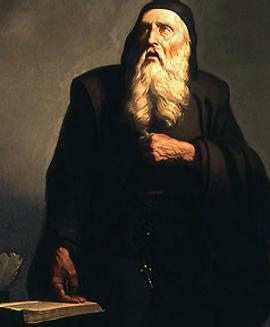 In 1265 he had a religious epiphany, and became a tertiary Franciscan. He wrote numerous religious treatises and made several missions to northern Africa, trying to convert the infidels (Arab muslims) of Tunis to Christianity. He even preached for a unification of the three monotheistic faiths—Judaism, Christianity and Islam. He hoped that together these religions would be able to defeat Asian invaders then threatening Europe and the Middle East. Llull was a passionate Christian, but had some very dangerous ideas (to Pope's mind). He tried to combine religious and philosophical attributes selected from a number of lists and make logical and religious deductions using a mechanical device. Llull tried to show that Christian doctrines could be obtained artificially from a fixed set of preliminary ideas. His rationalistic mysticism was formally condemned by Pope Gregory XI in 1376. Later, the Catholic Church beatified Llull (gave him the title "Blessed"), when his following was confirmed in 1858 by Pope Pius IX. But yet he was not been canonized as a Saint. While he was called Doctor Illuminatus, he is not one of the 33 Doctors of the Church. Around 1275, Llull designed a method, based on something like a logical machine, which he first described in full in his Ars magna generalis ultima. Ars brevis ("The Ultimate General Art", published in 1305). This was a method of combining religious and philosophical attributes selected from a number of lists. It was intended as a debating tool for winning Muslims to the Christian faith through logic and reason. 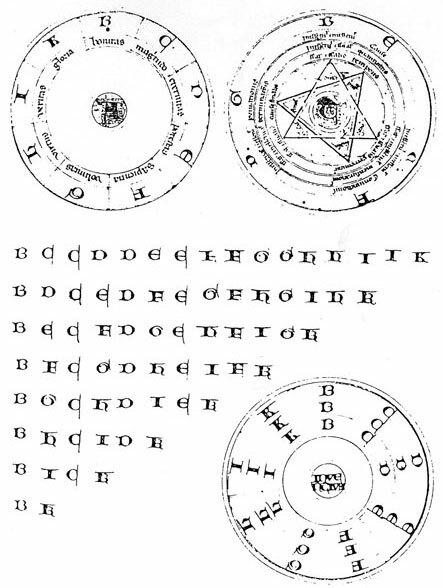 Llull's inspiration for the Ars magna is thought to have come from observing a device called a zairja, which was used by medieval Arab astrologers to calculate ideas by mechanical means. It used the 28 letters of the Arabic alphabet to signify 28 categories of philosophic thought. By combining number values associated with the letters and categories, new paths of insight and thought were created. The radical innovation Llull introduced in the realm of logic is, in fact, the construction and the use of a machine made of paper to combine elements of thinking, i.e. elements of language. With the help of connected geometrical figures, following a precisely defined framework of rules, Llull tried to produce all the possible declarations of which the human mind could think. These declarations or statements were nevertheless represented only by a series of signs, that is, chains of letters. This doesn't look very impressive, does it!? It is just three circles and some kind of alphabet. Every single letter, from B to K, represents not merely itself, but several strictly defined and placed meanings. By writing the letters from B to K as key-terms heading a table, a series of different sentences can be easily constructed. For example, B=Bonitas, C=Magnitudo, D=Duratio, E=Potestas, F=Sapientia, G=Voluntas, H=Virtus, I=Veritas and K=Gloria. This is, initially, the paper-circle called the Prima Figura. 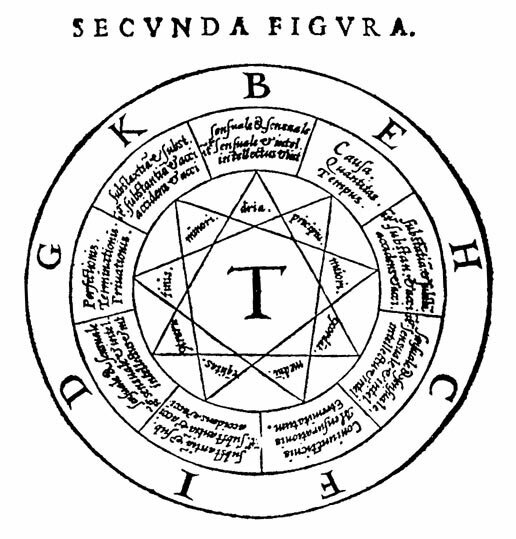 The next strictly defined table of words can be produced on the next circle, perhaps as seen on the Secunda Figura (shown below), where we find categories and relations of thinking. Hence the machine allows all the words to be combined by turning the circles step by step. In this manner, it is possible to connect every word with every other word placed in a position of a table—depending only on the construction of the individual tables. Imagine how Llull could play this out: bearing in mind the inscribed words of the Prima Figura. These nine words are none other than the attributes of God. Combined with a table of nine questions, it is possible to construct the skeleton of the "Proofs of God." The machine shows all possible statements and declarations about God. Examining the next design from the treatise, the so called Tabula Generalis, we can find a very interesting table. Behind these series of letters are the hidden words of the utilized tables. These columns of letters are supposed to represent, very precisely, neither more nor less than, the totality of human wisdom;-), but actually the letters of the lullistic alphabet contain a rich potential of meanings. The connection to a certain site in each table allows each letter to represent unlimited words of unlimited fields. 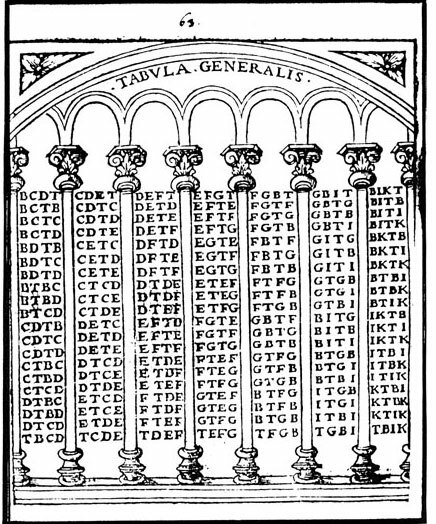 So, this Tabula Generalis must have been something like a subset of the truth table of the logic, described from the notions and defined in the circles. The logic itself consists of all possible reasonable combinations of the notions. While we have no rules, algorithms, or programs to tell which combination was right or wrong, we could have a truth table (I'm just wondering. Who knows how to compose such a table?). And if we can include in the proper circle each human-defined notion, and we have a proper entry in the table, then we have what? Bingo! We have the Universal Wiseacre. One can ask "What exactly is Ramon Llull's place in the history of computers and computing?" The answer is: Llull is one of the first people who tried to make logical deductions in a mechanical, rather than a mental way. His method was an early attempt to use logical means to produce knowledge. He demonstrated in an extremely elementary, but nevertheless workable, way that human thought can be described and even imitated by a device. This was a small step towards the thinking machine. But every journey, even the longest, begins with a tiny step. 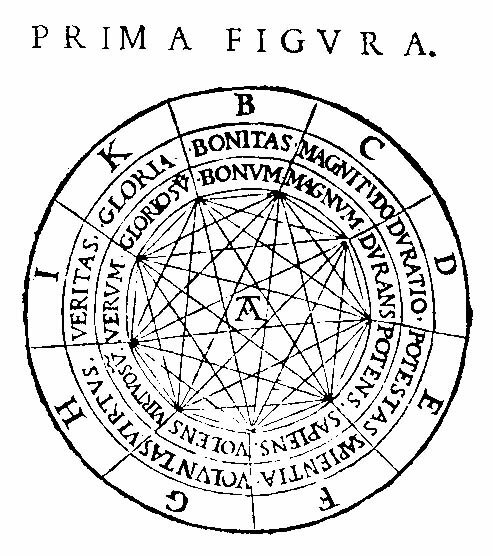 Llull's ideas would be developed further by Giovanni de la Fontana and Nicholas of Cusa in the 15th century (in his work De coniecturis Nicholas developed his method ars generalis coniecturandi, in which he describes a way of making conjectures, illustrated by wheel charts and symbols that much resemble those of Llull), Giordano Bruno in the 16th century (Bruno used the rotating figures of the Lullist system as instruments of a system of artificial memory, and attempted to apply Lullian mnemotechnics to different modes of rhetorical discourse), and by Athanasius Kircher and Gottfried Leibniz in 17th century. That's why Llull is sometimes considered a pioneer of computation theory, especially given his influence on Leibniz.